One of the ideas discussed in Future Craft was how products can shape society, and that, possibly, by being conscious of what we are designing and producing, we can influence society – ideally, for the better! Before you can influence society in the way that you want, first you must know what you want. To that end, we were asked to visualize our idea of a Utopian City. What would society be like, if it were perfect, or at least, more perfect than today. Though this is a lot to cover, I’ll play with a couple ideas that stuck with me and bridge multiple aspects. There is such little space in cities to begin with, that it seems silly to waste such usable areas as rooftops. 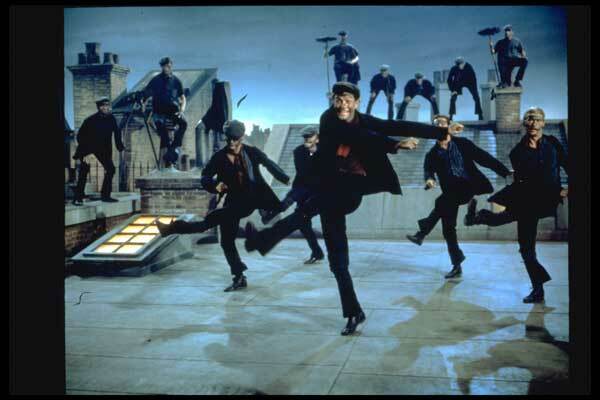 Occasionally people will have roof decks, but in general, city roof tops are only accessible to the likes of Mary Poppins and the chimney sweeps. Imagine if instead, every roof had a garden, or solar panels, or a windmill. Since most city buildings house multiple family units ‘under one roof’, roof gardens could be communally tended by the people in it, or set up like a CSA. Another option would be for rooftops to be public property which the city cultivates and harvests, providing the food to the city inhabitants (pricing structures could vary). Building units could also decide to maintain energy generating systems on their roof instead. Either way, roof tops would be contributing to the community while also providing local, reusable resources in the form of energy or food. Another space eater is motorized vehicle traffic and support systems. Imagine how much space is devoted to streets and parking in cities! I know saying ‘get rid of the cars!’ is not a novel idea, but what caught me in the “get rid of the cars!” cries was how to handle basic logistics with no motorized vehicles. How would new dish washers be delivers? How would Ambulances arrive at houses? We do need some sort of industrial transportation infrastructure. As a compromise, I propose keeping streets, but moving them underground. Actually, moving a lot of things underground. Imagine, the only thing moving above ground are people using their own power –walking or bikes. How much more space in the city could now be used for parks, art galleries, fabrication workshops, theatres, etc.? While humans moved around above ground, professional, necessary serves would happen underground – mass transportation, bulk delivery, waste removal. People would not have personal cars in the city, but if they needed to transport something larger (say, a musician needs to get to a gig with his bass and amp) he could call the equivalent of a taxi to take him there – underground! Being able to quickly get from one place to another, and move through loading docks and other areas meant specifically for larger equipment would be a huge boon to business. Additionally, home delivery would be standard for many items we currently purchase and transport ourselves. It would be much more efficient for Ikea or grocery stores to make deliveries to each house from one larger truck than for everyone to individually transport their items home. And since every basement would be a loading dock, it would be convenient for the individual as well. With all this reclaimed roadway, there is now space to use for community development. Yes, parks are great, but what about other community resources, like art galleries, fabrication workshops, community theatres, auditoriums, educational centers, sports complexes. Though some of these exist in limited form, and mostly by expensive subscription, if there was space designated for such community resources, they could exist in more places, meaning people wouldn’t need to use cars to get to them, and would also help build the community, giving people something to gather together for, besides the local pub.